The route from Narada Falls to where we split off to Mazama Ridge was in excellent shape and well broken in. 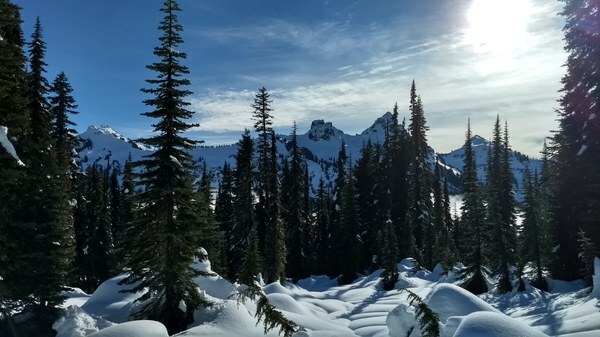 Once we got to Mazama Ridge, we encountered completely unbroken snow which was very beautiful but tiring to break through. We arrived at Longmire just before the gate opening. From there we drove up to the parking lot at Narada Falls and performed the pretrip checks, introductions, etc in light, cold, misty rain. Around 10:00 am, we gathered our gear, we walked up to the trailhead and the clouds parted, rain stopped, and the sun started to shine. This beautiful weather stayed with us throughout the rest of the day. We took a slow, easy pace. The trail from Narada to the junction with the trail to Reflection Lakes was well traveled and easy to snowshoe. From here, we branched off towards Mazama Ridge heading in the direction of Lost Lake. Because of the recent snowfall on Thursday (at least a foot of fresh snow) we found breaking snow up to our knees to be a very tiring and time consuming process. Regardless, we worked our way along the ridge to an open spot on the basin just under a quarter mile from Lost Lake where we had lunch and decided to head back to the trailhead. Around 1:50 pm, we started back towards the trailhead and were headed out of the park by 4:15 pm. While we didn't reach Faraway Rock, we had a beautiful day and learned a lot about punching through fresh snow and navigating in snow covered terrain.